Started stitching the last design for the Seasons in Chalk series with Hands on Design and "me" for Just Cross Stitch Magazine.. This one is my favorite but I L-O-V-E them all ! The Summer design is out in the current issue.. 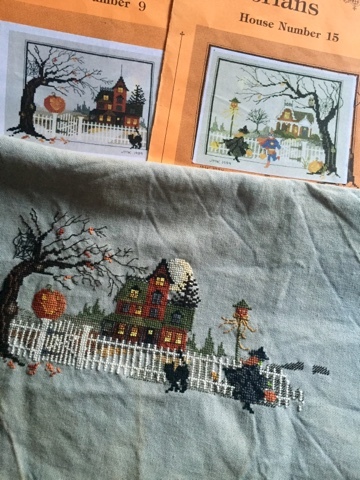 I try to use Fridays to stitch on Fall designs so this one got worked on last night ..EEk there's a witch :) They are from Judith Kirby and you stitch them both together ..it is super cute! I just Love the fence ! 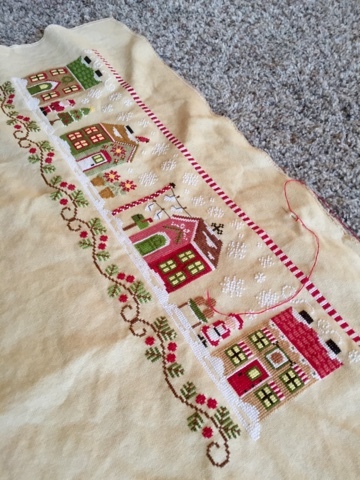 I am keeping up with my Santa's Village from Country Cottage Needleworks ..One a month ..this month it was Mrs. Claus cookie cottage.. 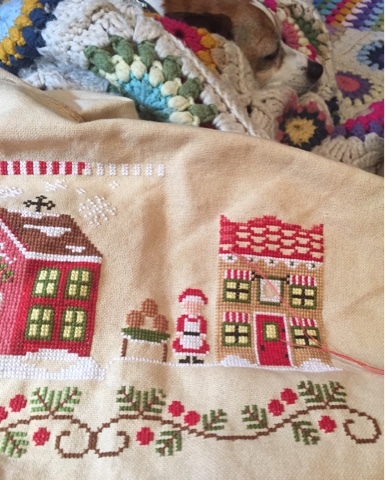 This is super cute but hard to get a good photo ..Saving the french knots until the whole piece is completed. Well..that's it for now.. Have a great weekend! I have been happily working in the yard .It is finally warm enough ..and today I am tackling the compost pile and digging out all the compost . Got to get myself ready for that chore ..LOL! I'm so amazed at your work. I have a Judith Kirby witch shoe I believe (was sent as a gift) however I have never stitched so small and am afraid to even attempt it on the gorgeous linen piece it came with.. Any advice? Just beautiful and an heirloom to cherish Priscilla. 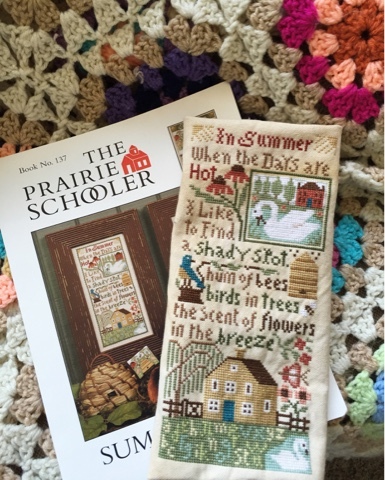 I am working on Prairie Schooler's Sunny Days from 2011. It is a series of small ornaments but I am stitching them all together. I am going to frame it and display it on my breakfast bar for summer. Love those fall projects too. 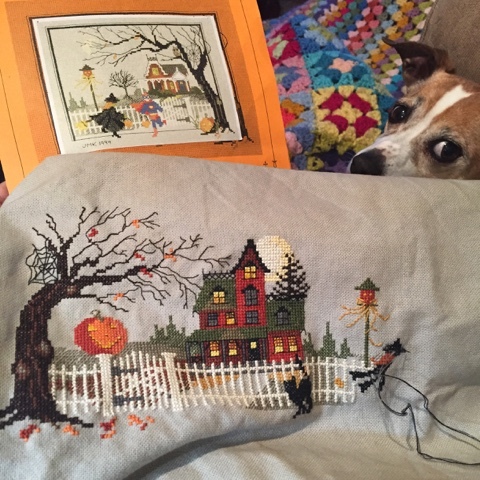 For some reason, I am really drawn to fall stitching. You did an amazing job for your daughter and SIL. I know. I have tried, and it IS hard to get a design the way we want when making up a pattern for ourselves! Love your ring pillow, it is super cute!! Your wips are beautiful!! The pillow is wonderful!! You did a great job designing! Can't wait for the new JCS issue!, I am addicted to these chalk designs!! I love them all!! Your blog is my favorite!!! 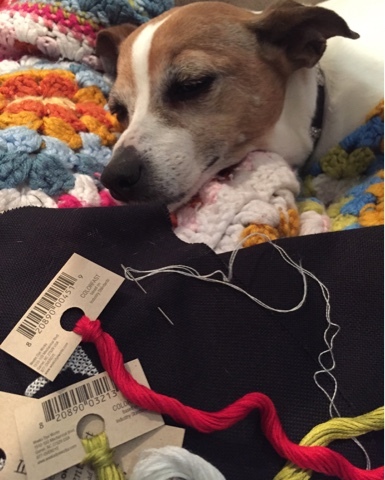 Oh, what an exciting day you have coming up, Priscilla--congratulations to your daughter and her fiance :) The ring-bearer's pillow is so beautiful and you did a wonderful job on both designing and stitching it. What a special touch that will be to her day! Love, love, love the PS finish and the Judith Kirby scene is delightful. I only had the first of the patterns so stitched that one on its own. Best of luck as you count down the days--enjoy! Love the ring bearer pillow! You did a fantastic job designing and stitching it. Just got the latest issue of JCS yesterday. 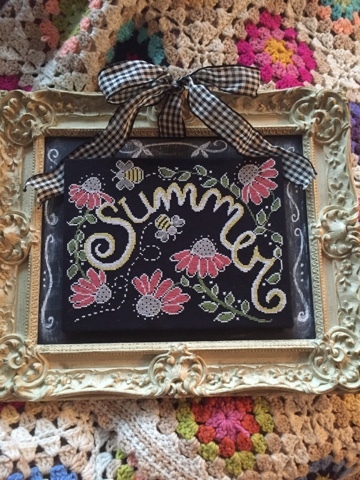 Looking forward to stitching the summer chalkboard. I first charted my own design 6 years ago when I couldn't find a 25th anniversary sampler that I liked. It wasn't all that easy to do so I have since invested in PCStitch pro to chart my ideas. I love your ring bearer pillow. 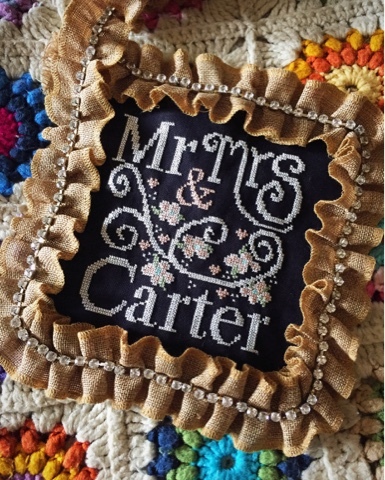 What a wonderful keepsake for your daughter and her husband.